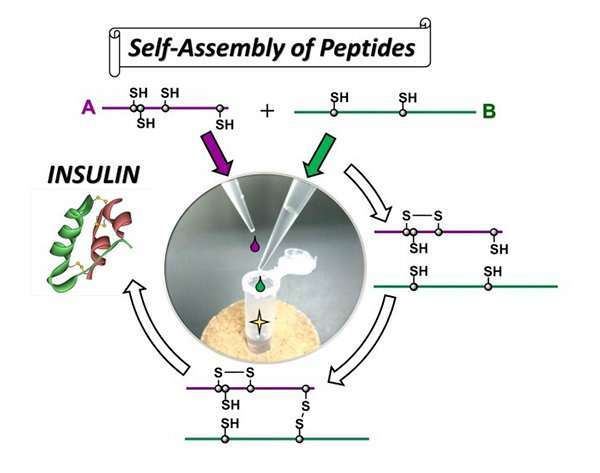 Researchers at Tokai, Osaka, Tohoku and Fukuoka Universities report in the journal Communications Chemistry on the synthesis of insulin based on the self-assembly of polypeptide chains at about 40 percent efficiency. This new approach is expected to enable flexibility in synthesizing order made insulin compounds that cannot be produced using conventional biological approaches based on genetic engineering. The research team has previously reported on the efficient chemical synthesis of insulin (seleno-insulin) in which selenocysteine was substituted for insulin containing cysteine to replace the SS bond between the peptide chains with a diselenide crosslink. In their most recent studies, improvements have been made on the previous synthesis method of seleno-insulin and natural insulin (bovine insulin) has been produced at a higher yield (approximately 40 percent) than seleno-insulin. By applying this new method, they have succeeded in the efficient chemical synthesis of insulin families such as human insulin and human type 2 relaxin. The team first examined the process (oxidative folding pathway) by which insulin A chain and insulin B chain combine to form the structure of natural type insulin. Based on the pathway, they succeeded in optimizing folding conditions of bovine insulin and obtaining bovine insulin at high yield of about 40 percent. The advantages of this synthesis method is that it does not require any large-scale production equipment because it does not use any genetic engineering technique and insulin can be produced by the simple process of mixing A chain and B chain—both of which can be synthesized by a solid phase peptide synthesis method using a resin.